Save up to 10% on RBP Jeep Products at CARiD! If you're looking to customize your Jeep and increase its performance or functionality, RBP will help you out with their extensive product line. Today we are here with the new offer on Jeep products made by RBP! Until May 31 save up 10% OFF the original price with the purchase of Jeep products by RBP. Prices are already reduced. If you were looking at getting one of the RBP custom grilles, a set of wheels, exhaust tips, side steps, lift kits or anything else, but wasn't ready for a purchase, it's the right time to act. Hurry up, this offer won't last forever! Leave your inquiries in the comments below or contact me directly in PM. Buy G2 Axle and Gear products at CARiD - Get a gift! Receive up to $50 Prepaid Reward with Go Rhino Products at CARiD! Save on Rampage Jeep Equipment with CARiD! Up to -25% on all Rugged Ridge products at CARiD! New Deal from Smittybilt at CARiD on selected Jeep Products! 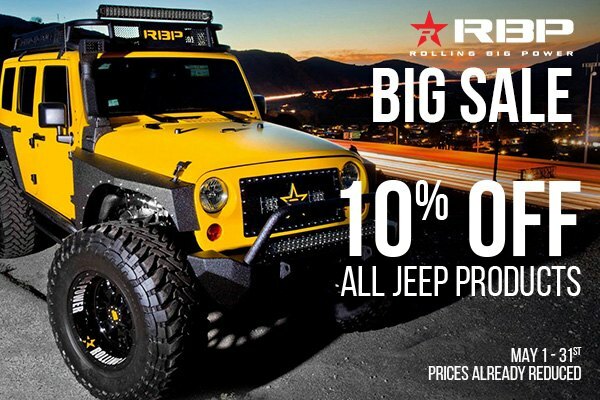 Quick Reply: Save up to 10% on RBP Jeep Products at CARiD!